Born in the Abruzzo region of Italy, Bernardo, along with his wife Androulla, has spent over fifty years building up the popular and successful La Gaffe Restaurant, Guest Accommodation and Wine-Bar on Heath Street in Hampstead, London. Hospitality was his vocation but writing was his passion and over the decades, alongside the hard work put into running La Gaffe Bernardo managed to find time to write plays, poems, books and screenplays. 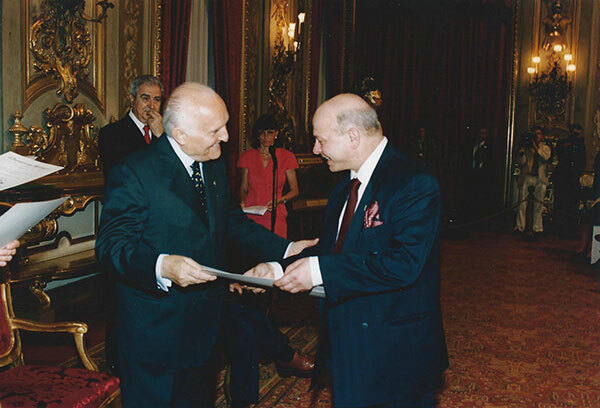 This dual activity led in 1998 to Bernardo being awarded “Cavaliere d’Italia” for his services to Anglo-Italian relations. As a playwright, although Italian by birth, Bernardo writes in English. His scripts have attracted increasing attention. His plays, “Living in Hope”, “The Scourge”, “Autumn Music”, “When in Rome”, “Ghosts of Eden”, “When the Grapes go Sour” and most recently “The Tree” have been extremely favourably received on the London Fringe and aroused international interest, securing him representation in Europe, Australia and Canada. It was the encouragement of Jack Bradley, Literary Manager of the Royal National Theatre, that prompted Bernardo to complete a diploma course for playwrights. It was at the University of Sussex that, as part of his course work, he wrote “The Tree”, an impressive drama on the war in Bosnia. His intensive research for his project took him to the war-torn city of Sarajevo itself, and the work has attracted the interest of the Royal Court Theatre. “Living in Hope” at the Jack Straw Theatre – Hampstead 1993. “The Scourge” at the Pentameters theatre – Hampstead 1996. “Autumn Music” at the Pentameters theatre – Hampstead 1998. “When in Rome” at Theatro Technis – Camden 2000. As a young man, Bernardo joined a seminary aiming to become a priest. However, he found the enforced celibacy too demanding and entered the world of catering instead. A talented footballer, he considered this as another career option, but, on coming to Britain in the fifties, he was enforced by his work permit to stick to catering. His book on his career in England, and the development of La Gaffe, which has proved the inspiration for much of his writing, is due for publication in the near future. Bernardo Stella born Gessopalena in Italy 1936. Began writing poems and song lyrics in English 1977. Progressed to novel writing 1981. Awarded the ” Golden Chef of the year” 18 November 1997. ” “Cavalierato” from the Italian Government June 1998. “Cavalierato” from the Italian Government June 1998. Reached the final of the “Carlton television Evening Standard Awards” for best Restaurant 1999. Joined “Sussex University ” for a course in dramatic writing 2000. Diploma in playwriting at the above university 26-1-2001.